But it doesn’t have to be that way, you know. Milk chocolate can earn a highly regarded place in our pantries and on our dessert plate. It just needs a little help from some friends. And that, is where hazelnut and nutmeg come in. In a game of word association, you say hazelnut, I’ll say chocolate, I say chocolate, you’ll say hazelnut. Sure, they have other partners that they work with just as beautifully, perhaps even more so (chocolate with citrus, hazelnut with brown butter, chocolate with coconut, hazelnut with figs…Don’t get me started! ), but that’s no reason not simply to accept and run with the fact that milk chocolate together with hazelnut is a little taste of heaven. 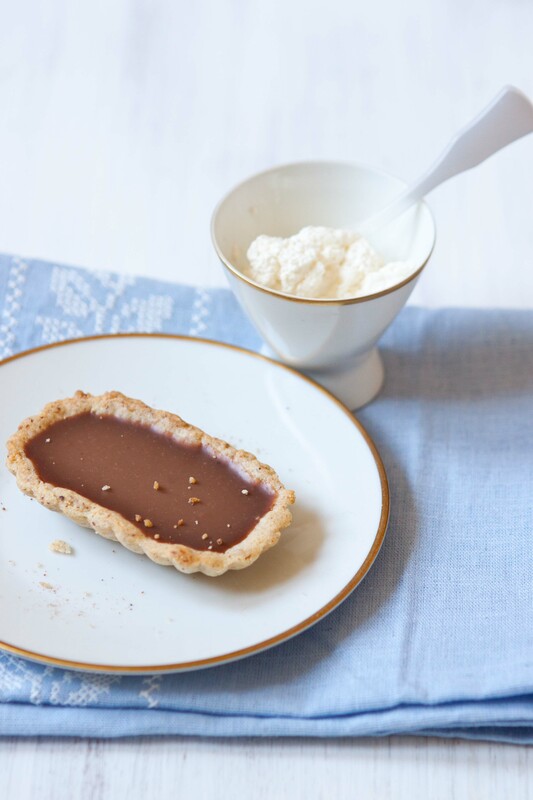 So, if my plans for a Sunday dinner turn out to include a note to myself about trying a chocolate tart, well a note about a hazelnut crust quickly follows (and whipped cream flanks them both, of course). 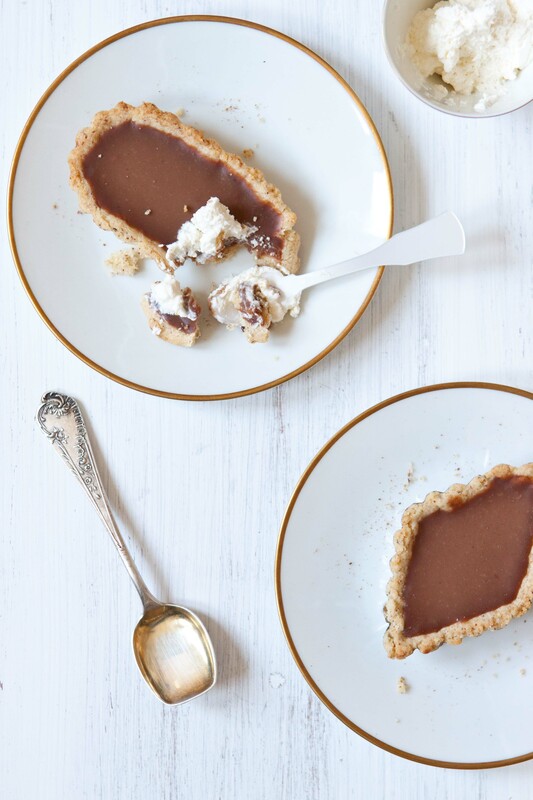 The nutmeg is the more unexpected note in a milk chocolate tart. But, like the perfect ending to a good novel, while it surprises you, as soon as you’ve read it (or tasted it) you know it makes perfect sense and you feel as though you should have seen it coming all along. The milk chocolate-nutmeg suggestion came to me, of course, from my – now rather finger printed and dog-eared – flavor thesaurus. I read it, and was instantly taken with the idea. Of course. Of course! The sharp, pungent scents of pine, citrus, nut, and pepper in nutmeg lighten the heaviest of cream dishes and cut through the cloying-est of sweet ones. It can do for milk chocolate what it does for eggnog. That is, temper the absurd richness with a mouth tingling spicy warmth that makes it all too easy to have far too much. And that brings us to this tart. At least the tart doesn’t have booze (though I won’t try to stop you from adding some). It is both predictable and unique. It tastes amazing. 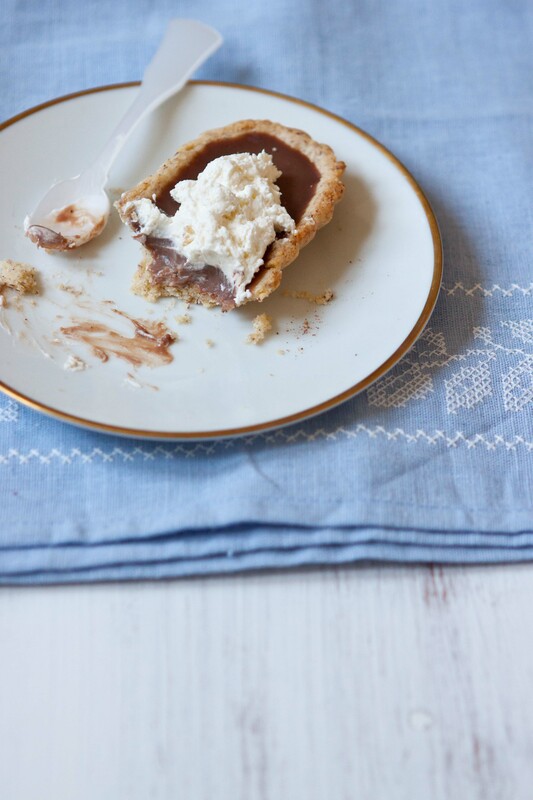 The milk chocolate ganache filling is as silky and smooth as a rose petal, the scent of nutmeg evocative, the crust nutty and sturdy, but light and bursting with hazelnut flavor. Chocolate, silk, roses, evocative… um, is anyone else getting a distinct – if slightly precious – Valentine’s Day vibe here? This recipe makes one regular 9-inch tart, which can be sliced into wedges and topped with whipped cream for serving. However, I received little tartelette molds back for my wedding shower last year, and I decided it was high time to give them their maiden voyage. So, I made a dozen tiny individual tarts. And, while they are a bit tricky to unmold, little finger desserts do allow you to eat your tart while staring romantically out the window, like some creatures I know. Finely chop your chocolate, and cut your butter into several smaller pieces. In a saucepan, bring the cream and 1/4 tsp. of the ground nutmeg just to a boil around the edges. Remove it from the heat and immediately dump in the chocolate and the butter. Let it sit undisturbed for a minute. Then gently, starting from the center of the pot and stirring in small circles, begin to stir the melted chocolate into the cream. Stir in progressively larger circles (but still gently because you don’t want extra air to get in there and ruin the silky consistency) until it is completely mixed and is a uniform color. Set aside an allow to cool for just a bit, around 10 minutes, then taste and add up to another 1/4 tsp. of nutmeg to get a nice spicy flavor in the chocolate. Next, pour the chocolate mixture into the pre-baked tart crust. Set it in the fridge and let it chill for a couple of hours before serving. Serve chilled in thin slices with soft pillows of whipped cream mounded on top. 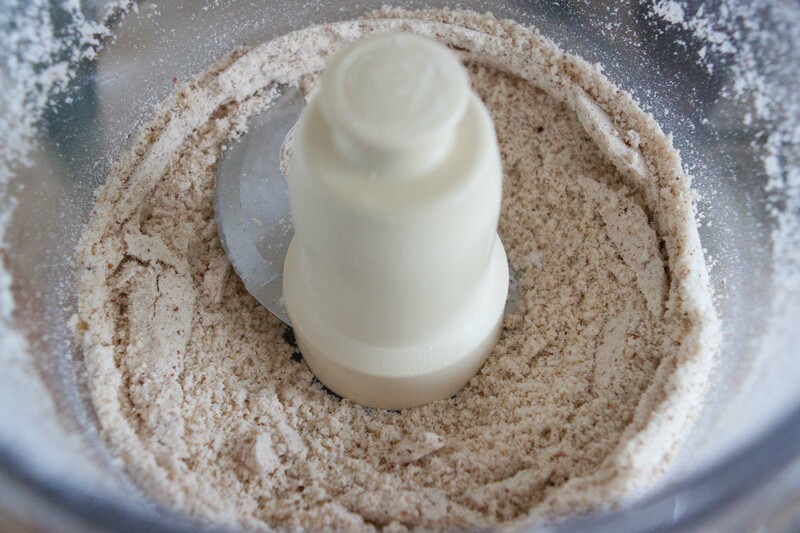 In a food processor, grind the hazelnuts and the flour together until you have a pretty fine powder. Transfer this to a small bowl and whisk in the baking powder and salt. 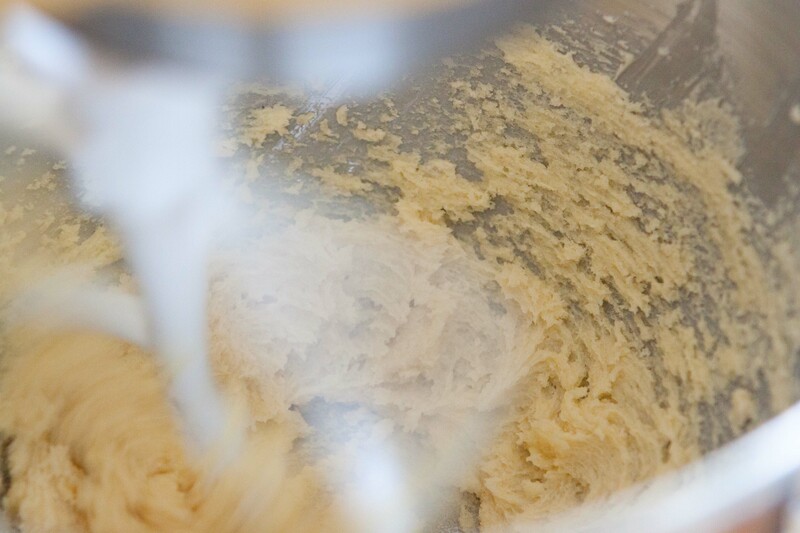 In a standing mixer, using the paddle attachment, beat the butter at medium speed for a minute. Then, beat in the sugar on medium high speed until the butter and sugar are light and fluffy and fully creamed together (about 6 minutes). Stop on occasion during this process to scrape down the sides. Beat in the egg yolk until fully incorporated, a couple minutes. Use a spatula to fold the dry ingredients into the wet. Then, mix it with the mixer on slow speed for a couple of minutes, until completely combined. Stop and scrape down the edges now and then to make sure everything gets mixed in. Gather the dough into a ball and pat it into a thick disc, wrap it in plastic wrap and chill in the fridge for at least 2 hours or up to 24. 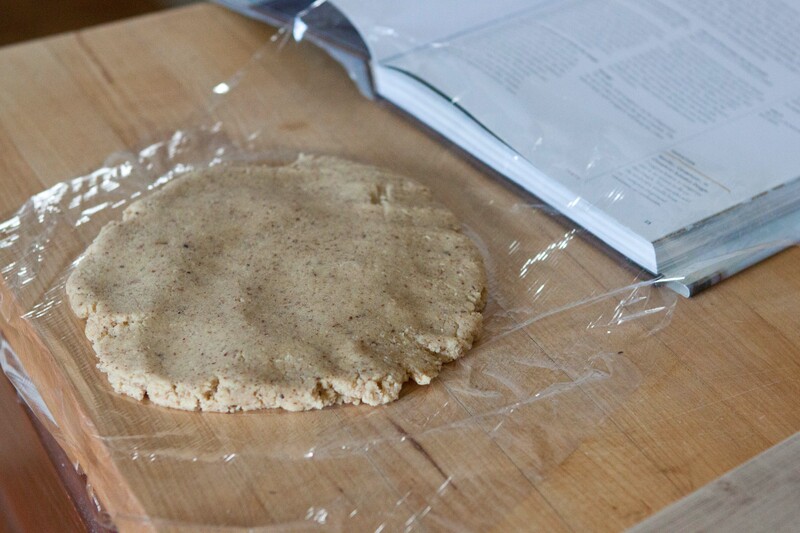 On a lightly floured surface, roll out the crust and carefully transfer it to a 9-inch tart pan. Press it into the tart pan, using your fingers to press together and fix any cracks (my dough cracked quite a bit, but it was really malleable and easy to press back together, making it quite nice to work with). Freeze the tart shell for 30 minutes. Preheat your oven to 350F. Line the frozen tart shell with parchment paper or aluminum foil and fill it with dry beans or pie weights. Put it in the oven and bake for 30 minutes. Take it out of the oven, remove the weights and lining, then pop it back into the oven to bake for another 10-15 minutes, until golden brown. Transfer to a cooling rack, and allow to cool before filling with the chocolate filling. Yum and I love those Tart molds! You don’t happen to know where they came from? Thank you! I’m not totally sure about the tart molds. They’re from a little kitchen shop in the town where I grew up and where we had our wedding. I think they’re from a company called Scandicrafts, though. Your puppy is adorable! The tarts look adorable too. For the other commenter who was asking, I believe Amazon.com and Williams-Sonoma carry mini tart pans…and I should go order some now too. holy yum. you are really awesome. i would probably eat all of those on my own. It was hard not to. I was glad I had people to share with! That is decadent! that’s all i have to say. To say the least! Teehee! Flavour Thesaurus is one of my all time favourite books, it’s funny, I just read about the nutmeg and milk chocolate pairing yesterday when trying to spice up a chocolate mousse. Yay! I’m glad to hear I’m not the only one who’s obsessed with that book. It is *so* funny! Gorgeous! I love the idea of a hazelnut crust. Bookmarking this one. Thank you! The crust is super delicious, and could be used for all sorts of tarts, actually. I’m glad that you gave milk chocolate the help it deserved. I too am a huge dark chocolate fan, so baking with milk chocolate always takes a little convincing. I think you may have me convinced though! 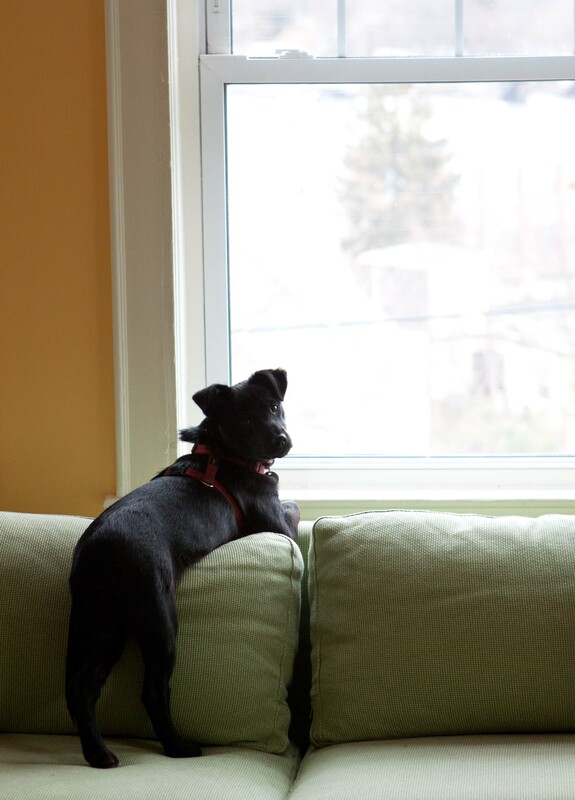 Squid is as cute as ever! You are currently reading Chocolate and nutmeg tart with hazelnut crust at Five And Spice.